As a way to beat the winter blues indoors, and up-cycle at least one diaper box into something fun, I created a little house for my daughter’s stuffed animals. She is obsessed with animals, mostly from watching Dora and Diego shows, so this box became a perfect little home. 1. Use a utility knife or box cutter to cut a door and a few windows. 2. Tape the roof together using additional cardboard pieces (if necessary). Clear packing tape or duct tape seem to work well. 3. 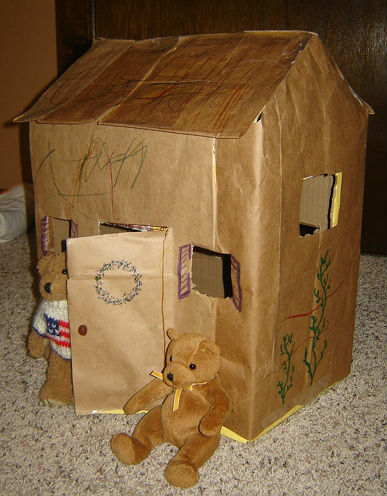 To cover the house, cut apart a large brown paper bag and fit to size. I used the bottom of the bag to create the roof’s shingles. 4. Use markers or crayons to decorate. This was a really easy project that probably took less than 45 minutes to do. Have fun! This entry was posted in DIY Crafts, Kids and tagged Cardboard box, cardboard boxes, cardboard construction, Cardboard toys, crafts, Do it yourself, Duct tape, Packaging, Utility knife by Cathy O. Bookmark the permalink.